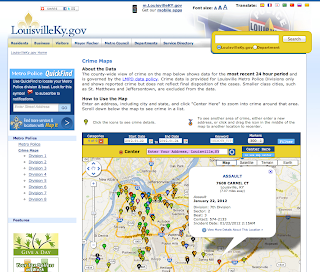 The city of Louisville Metro has partnered with our government open data services and mapping company GovMapper to bring a daily crime incident reports map from the LMPD to the citizens of Louisville. There are maps for every police division and beat in the city, with data updating daily. The map customizations also allow the LMPD to include links to specific dynamic maps highlighting recent crimes for their community newsletter alerts. Launched last week, this is the first time citizens can get daily crime updates from the LMPD with date range and category filtering. The service also includes mobile phone access, search exporting, and city-wide heatmaps of crime. It allows full access to the raw data with latitude and longitude, fostering transparency and open data. Programmers can also grab the data on-demand for their sites and apps through the Your Mapper API. Your Mapper also curates a complimentary detailed historic crime reports map going back to 2003, which is updated every month. I credit the office of Mayor Greg Fischer with helping to get this project started (via a tweet in June), and seeing the opportunity for cost savings from public online mapping. From there Metro Technology Services took over to bring the map to fruition. They turned to us, the only area Google Qualified Maps Developer. One of MTS's goals is to save the city, and therefore taxpayers, money across all departments. They know that by promoting government transparency and open data by putting data online in a way the general public could understand and use would have a huge ROI by reducing the thousands of FOIA requests the city has to fill. If the public can discover, visualize, and export the data they need online 24/7, then wouldn't have to contact the city for time-consuming data requests. Another goal of MTS is to create a catalog of raw open data for the public to download and use on their desktop, on websites, and in mobile apps. To this end they have Louisville's Open Data Initiative, which aggregates data across agencies. GovMapper has enhanced their raw crime data by adding latitude and longitude to each report, and then providing the entire dataset for download on the public open data site (see CrimeStats.txt).